Lavender Landscapes was founded in 2004 by Shane Murphy, a well respected Garden Designer from Cork. Shane with the help of his team has developed it into a successful business renowned for excellent workmanship, top quality and innovative garden design. Prior to setting up his own business, Shane had gained valuable experience working in various aspects of garden design and horticulture. His enthusiasm and passion for creating the perfect outdoor space led him to set up his own garden design and construction company, Lavender Landscapes. 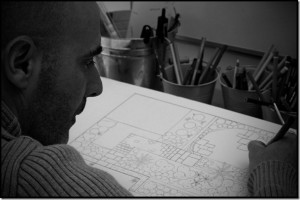 ” As a Garden Designer, I will work with my clients to design an outdoor space around my clients needs that is beautiful, functional and interactive” Shane Murphy, Garden Designer. Over the years Shane and his team have built up quite a portfolio of garden designs all over Cork City and County. They all feature the same high end, top quality garden design and workmanship. It is this attention to detail and innovative design concepts that have gained Shane a reputation as one of the County’s top garden designers. Lavender Landscapes will focus on creating a garden design in tune with a client’s lifestyle needs and requirements. Whether it’s a secret relaxing rose scented hideaway, an exciting colourful perennial explosion or even a hardscape architectural wonder, Lavender Landscapes will use their design experience to integrate a client’s own ideas into a design presenting the client with an exciting array of possibilities for the use of the space available.